The bedroom is a place for you to relax and regain energy after a long day. Knowing how to design your bedroom to ensure that you get a good night sleep can be incredibly beneficial. Here are a few pointers to consider when you are designing your bedroom and adding decor. Darkness is an important factor for a good night sleep. Darkness releases the hormone melatonin, otherwise known as the “sleep hormone” which helps us get to sleep and stay asleep. Making sure that you can have total darkness in your room can really make your sleep better. This might include adding block out blinds so that streetlights or the early morning sun don’t creep in and affect your slumber. When designing your home consider where you are placing windows and whether you can avoid harsh light entering in the morning. Avoid having any electronic screens or lights on when trying to sleep as well, as the blue light from screens can be harsh for your eyes. If you can, have a place where you can store electronics when you are not using them. 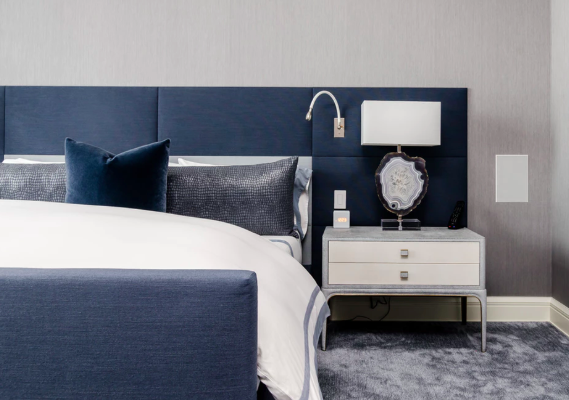 It is important to never underestimate the fact that less is more when designing your bedroom. 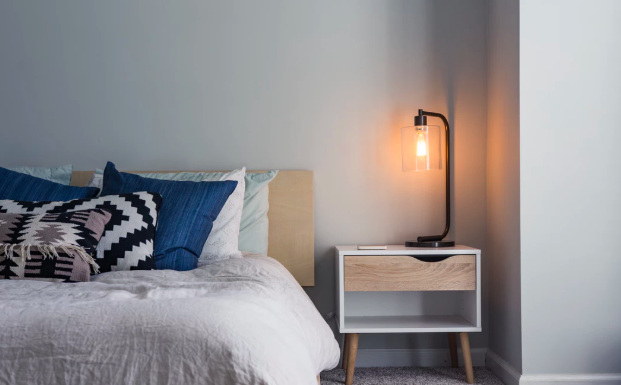 By aiming to achieve minimalism in your bedroom by only decorating with the essentials, and not overcrowding your space, you will find yourself feeling more relaxed and mentally decluttered. A messy and full space can lead to a messy mind and take away from the ability to relax enough for a good night sleep. Your bedding can change a lot about the quality of your sleep. There are a few things you can do to make sure that you are always comfortable during the night. Changing the type of your bed sheets seasonally can help immensely with comfort. During winter you might decide to opt for flannelettes to keep yourself warm, then return to a lighter cotton for the warmer seasons. A relaxing atmosphere is an amazing way to settle down and ensure that you will have a fulfilling sleep. Automatic spray units can be an amazing way to keep a scent in the air, particularly if you can find a lavender spray. Lavender and other floral scents like jasmine can aid in achieving a deeper and better nights rest. It is also important that the lights in your bedroom are not too harsh. Choose to buy warm, yellow light globes instead of white light as it will create a more comforting space that will let you feel ready to switch yourself off at night. Painting your walls and choosing a colour palette that consist of soothing tones can really benefit the vibe of your bedroom. When designing, consider warm hues and earthy tones that bring comfort to the space – well as cool tones like blue and green which have been proven to increase relaxation. A bright yellow might be nice in your kitchen, but not so helpful to look at when laying down after a long day. Contact us at iBuildNew on 1800 184 284 or book a call online for assistance in finding your perfect building and home design match. We can help you be one step closer to creating the perfect space for you and your family.